Alright! Alright! I hear you!!!! A lot of you have been asking about an update to the blog series “The Chase 2018” so here it is! To be honest I have not had much to talk about so that’s the reason for the delay in writing this latest blog entry. I had located some really nice bucks over the summer but they moved about the time they shed velvet and I have either not been able to find them or know where they are but can’t get permission to hunt those areas. I literally have not seen or gotten a photo of a buck I want to shoot since season opened. I do have one glimmer of hope however as one of the better bucks I have my eyes on moves to his fall range each September but returns to his summer haunts (where I can hunt) in January each year. I am hoping that this years colder weather brings him back a little earlier and we cross paths during the late season but the odds are admittedly very slim. I have had a few encounters with nice bucks this season so I will show a few photos of those bucks and give some details about those encounters. This buck that I call “Stickers” could have met his end Halloween evening. I shared a video on my Facebook page of this encounter where Stickers came in and bedded 30 yards from my stand for a couple of hours and then as shooting light faded got up and walked right under my stand. I know this buck is a minimum of 6 1/2 years old and may be older than that based on trail camera photo history. Now that we are getting later into the season and I still have 2 buck tags in my pocket, I will likely shoot this buck if I get another chance. He now has the best rack he has ever had but I just dont see him ever getting much better. It is time for him to go and a new younger buck to take his spot in the herd. Here is a buck I encountered on November 7. I also shared video of this encounter on my facebook page. This buck would probably nudge a hair over 160″ and is a mature 5 1/2+ years old. I had him dead to rights at 15 yards but he just isnt the kind of buck I am looking to put my tag on. I have had 2 encounters with this buck in the past 2 weeks. Both times he was pushing does just like he is doing in this photo (there was a photo of a doe running by just a couple of seconds ahead of this photo). I have the last two sets of shed antlers from this buck and know for certain he is 5 1/2 years old. In the past he has been a 5×5 with the forked G-2 on one side but this year he became a 4×4 with forked G-2s on both sides. I am hoping that next year he goes back to being a 5×5 but either way he is likely to get shot next season if he survives. I dont have any photos of this buck in hard horn yet unless they are on the cameras now. I did have a close encounter with him last week and he is more impressive in person than this photo shows. I did not have a shot as he was in the brush at about 40 yards but I did get a few seconds of video footage. He has busted off one of his G-2 tines but I would likely not shot him even if his rack was intact, If he had the missing tine he would hit 170″. I have seen this barrel necked 6×5, 5 1/2 year old three times from a stand but never close. I will be keeping my eye on this one for next season should he survive. So thats a quick summary of my 2018 season thus far. We are only at about the halfway point so there is a lot of hunting left to do. I plan to keep plugging away and hopefully fill a tag or two before the final bell rings. Best of luck to the rest of you whitetail maniacs. Shoot straight and be safe! 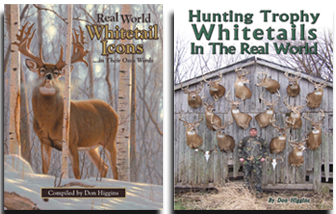 If you are looking for a Christmas gift for the deer hunter on your list, these high-quality hard-back books authored by Don Higgins are available right here on this website. All books are signed before shipping!